Native Americas worked with the raw materials and natural resources available to them and their task and knowledge of how to make a bow was critical to their lifestyle, both for hunting and when fighting enemies. One of the most important roles of the men was to make weapons and his skills in developing methods and techniques on how to make a bow. The Bow provided long range, accurate weapon with the opportunity to shoot rapid shots on foot or on horseback. There were different types and sizes of bows depending on what they would be used for. A Bow shot from horseback was smaller than a bow used on foot allowing for maximum manoeuvrability. Each Native Indian would enhance his technique on how to make a bow, it was a time consuming but essential task in the daily life of a Native American. The Native American would be aware of the natural resources in his area. The wood for the bow needed to be flexible, tough and hard. The best wood was obtained from ash, willow, hickory, juniper, oak, Osage orange, cedar, walnut and birch trees. The bowstring was made from animal gut, sinew or rawhide. Plant fibers were also used for bowstrings including nettles, dogbane and milkweed or the inner bark of basswood or yukka. Feathers were required to give arrows their 'spin' during flight and balanced the weight of the arrowhead to prevent the arrow from tumbling during flight. The feathers of the buzzard and turkey were easy to locate and to work with. The stave would be thinned down to create the desired depth of the bow, following the grain of the wood. A rough bow-shape was created sometimes using heat from a fire to assist the bended shape - the wood was selected for its flexibility. Notches in both limb tips were cut about one inch from the tip. The bowstring was made of gut, sinew or plant fibers that were twisted to make a cord. The bowstring was attached via the notches at either end of the bow. Notches were carved at either end of the arrows to accommodate the arrowhead and the arrow flight (feathers) that were attached using cord. Discover the interesting facts and information which relate to the History of Native Americans and the tools and weapons they used. 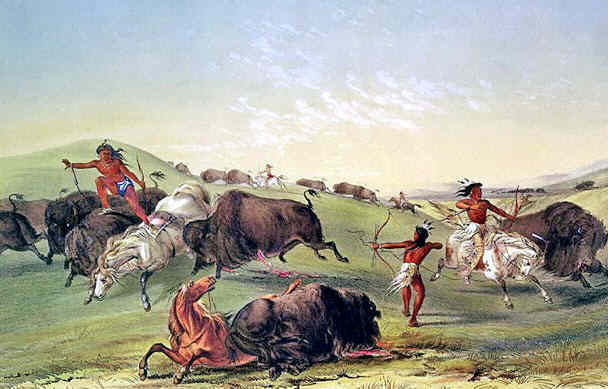 The pictures on this site show the weapons that were used by various Native Indian tribes that can be used as a really useful educational history resource for kids and children of all ages. We have included pictures and videos to accompany the main topic of this section - How to make a bow. The videos enable fast access to the images, paintings and pictures together with information and many historical facts. A great educational resource for kids providing an unusual insight into their culture.